Start using, Price, Time, and Frequency Waves. Identifies patterns using a multi-dimensional approach of using price, time and frequency waves. Draw out the pattern you see and the pattern will turn from grey to a color when your ratios are valid. Scan for stocks, futures or forex using our market analyzer scanner. All of our templates and workspaces are included and can be used in any market! Works in all markets and is a framework where you can modify existing ratios, change pattern names and make the tool exactly match to your needs to improve your pattern trading. Draw all styles of patterns. 4 Point Patterns, 5 Point, and 6 Point Patterns. All styles of patterns. For an example of what is possible, please visit our patterns page. Add in your ratios, name your pattern and the tools will start working for you. It’s an advanced tool that will do what you tell it to do. Each pattern will be represented by a different color. Bearish and Bullish patterns can have different colors assigned to them too. All pattern colors can be customized to provide the most flexibility. This is an extremely useful feature that allows you to set the minimum bar count that must be included in each pattern. If you’re wanting to see only patterns that have a certain number of bars in them, this indicator will let you do that. This is very useful if you want to keep all your trades over 30 bars for example. Allow for the ratios to be just a little more flexible. Eg: If one of your ratios required a 61.8, the flex ratios would allow a 61.9 to still be valid. Our XABCD™ Pattern Indicators for NinjaTrader 8 allow you to control how a high and low is identified to map in the pattern points. Example of Range Bars. Yes, any market (stocks, forex, futures etc), on any time frame, on any chart type. If you can pull up a chart in NinjaTrader 8, we can find the patterns. 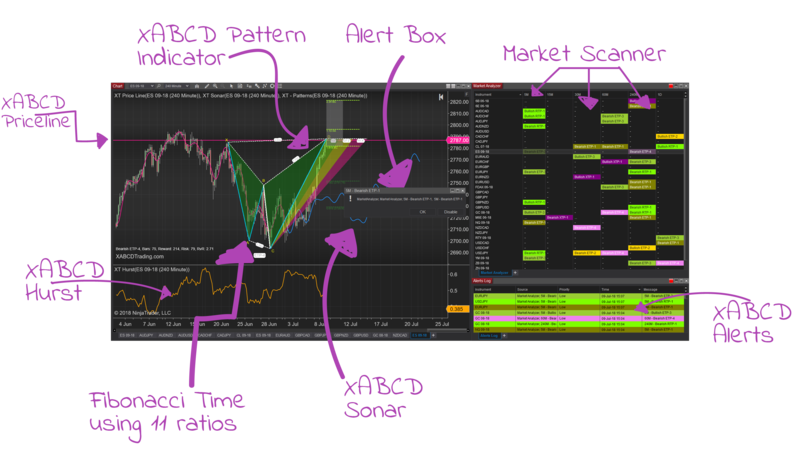 Included with the XABCD Pattern Suite – The XABCD Sonar Indicator is the squiggly line that you see on the charts that gets drawn into the future helping you weight your trades consistently. XABCD Hurst Indicator is also included with the XABCD Pattern Suite – This indicator runs below your chart and helps you calculate the data to using the Hurst Exponent to calculate if the data on the chart has more anti-persistence or persistence into the chart which can help you weight trades. Our drawing tools allow you to draw out your patterns without drawing out each individual price and time Fibonacci measurement. When the ratios become valid, the pattern will turn from grey to the color you select. Drop the “X” and what do you get? ABCD. These 4 point patterns will help you forecast where price is going. 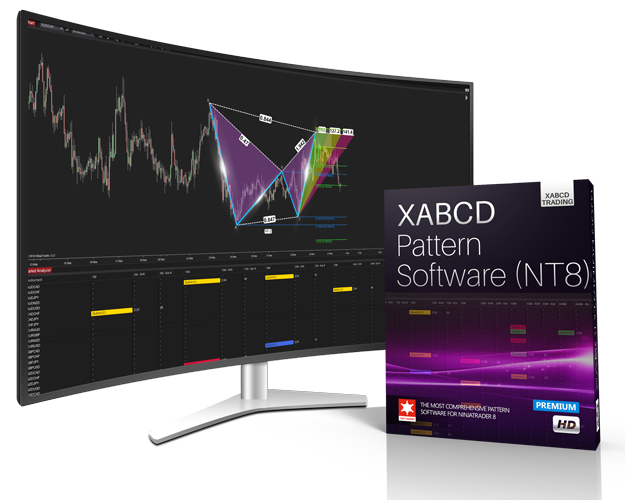 Draw any 5 points XABCD™ patterns, name them and watch them self-validate as their ratios become valid and the pattern turns an identifiable color. Draw any 6 points patterns, name them and watch them self-validate as their ratios become valid and the pattern turns an identifiable color. The pattern will change colors when the ratios are valid. As you move your mouse and start drawing in your patterns, the patterns magically appear. Once all the ratios fit the patterns they will alert you by changing colors. Colors can be customized. This is your control panel of all the patterns and ratios that you can specify, modify or even create your own. These ratios get applied to all our tools including the market analyzer so everything stays consistent. You will only be limited here by how many stocks, futures or forex symbols you can scan by your data provider. In most cases you should be able to scan entire markets. Our market analyzer pattern scanner will work on all markets. Scan the entire FX markets or stock markets with little effort. Add any other indicators to the scanner and make it totally customized to your preferences. 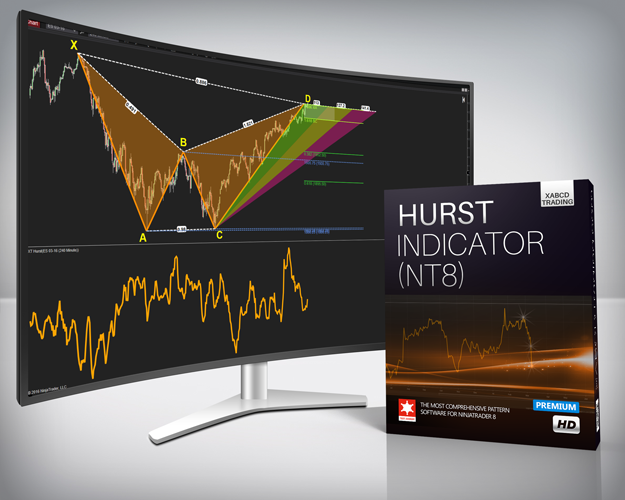 Any value, of any NinjaTrader built-in indicator will work out of the box! Do you only want to see patterns made up of 30 bars or more? Are there only certain patterns you want to scan? Not a problem, filter only what you want to see. Setup email alerts with chart images, or send yourself a social message on twitter, facebook or stocktwits. You can even use classical audio alerts. Want to Watch A Demo? Is this for lease or a life time purchase? Great question. We can do it leased monthly, or you can get a life time license. Please check out our membership details page. What if I need support installing the software? Just arrange a time with our support department, we can install NinjaTrader 8, setup our software and get some great templates setup for you to start using it right away. Can I customize the ratios of patterns? Yes, you can change all the ratios, change all the pattern names and have all the flexibility you want and need. Our product is like a framework so feel free to enter your own pattern ratios and call the pattern whatever you wish. Can you install it and set it up on my machine? Yes, we would be happy to do that for you. We’ll set it up the same way that you see it in all our videos and webinars, so that way you will have the same setup as what we do. Will I be taught how to maximize the use of the tools? Yes we have HD video content that will show you how to maximize your results using our tools which incorporate fibonacci price and fibonacci time with frequency wave analysis. What makes your software so unique? We don’t force you into trading certain patterns a certain way. We give you a framework that allows you to put in your own 4-point, 5-point and 6-point patterns. There are also some classical patterns we’re started expanding into and will continue with more in the near future. Name the XABCD™ patterns, configure the patterns and scan for the patterns anyway you want. Contact us! We would be happy to hear from you and answer each one of your questions. I like the indicator as I think it can help me to save a lot of time in founding trading opportunity. As part of the community for a while now, i must say im impressed. ALL the members are positive and helpfull. I traded before i came here, but slowly bled my account. Originally i just wanted the softwaer, and the mentoring not so much. although i came very far on my own, i wasnt nearly good enough and i was getting a bit lost. But Chris does a very good job making you realize things you overlook, and re-directing your energy to where it counts. still have 4 months to go, but untill now it has been a great value for money! We invested in this application a few months ago and we love it so far. I'm glad i got your tools, it have saved me a lot of time! I have for trading I spend it on the backtesting (I've got already 5 pairs backtested from 2005 1H + 4H 😉 using your incredible tool it's just so smooth ! By the way I've completely recouped the investment in the XABCD tool which is good ! I’m amazed at how the indicators can do the work in locating a possible pattern to trade. I use XABCD every day to find pattern, it is a great software. It’s very nice, clean, and efficient. The XABCD pattern indicator, if used correctly, is the only indicator I know which has really great predictive power! I have been using the indicators though and they are very favorable a better percentage of the time. I have one word for your software, MAGIC! What goes on under the hood of this tool must be so complex. Some how you made it so easy for people to use. The best thing about this is the flexibility to build to do whatever you want with it. Downloaded the indicators for NT8 and installed them. I am having a lot of fun playing with them. Looking like they just might work out for me!!!! Nice software. It installed easily and runs without a hitch. Y'all have really done great work with the software. I know this can sound a bit strange but the installer was a breeze. Was very simple to setup...great software. Giving in 4 stars for now but will upgrade to 5 when that 1 minor feature gets added. 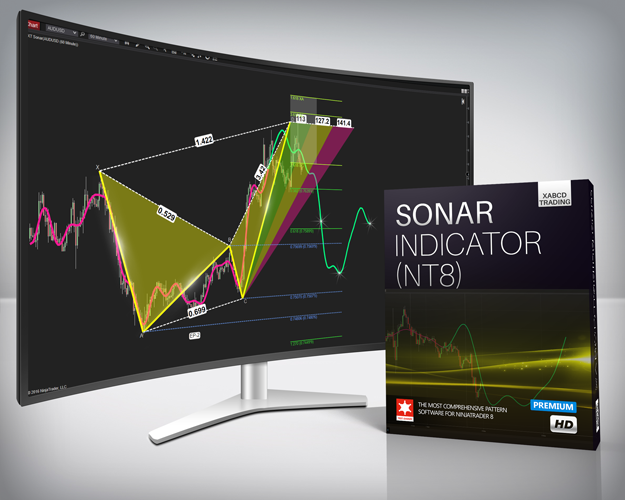 The indicators I purchased from you are doing well on my NinjaTrader 8 platform. The coding you had done for these indicators seems to be of exceptionally high quality, After rigorous testing I've encountered no issue's so far.....this very rarely happens. Keep up the great work over there. Very impressed with the overall operation at XABCD. Rating of Average of 4.91 on a total of 23 Ratings. Ratings are provided by members. We invite you to rate our products and services too when you get your own access.